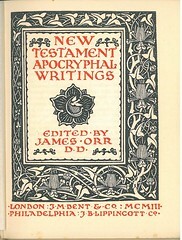 Title: The Temple Bible / New Testament Apocryphal Writings Edited by James Orr D.D. Publisher: London: J.M. Dent & Co., Philadelphia: J.B. Lippincott Co.
References: See Chamberlin 812-1 for information on The Apocryphal Gospels, Acts and Revelations, Translated by Alexander Walker. Edinburgh: T. & T. Clark, 1873. 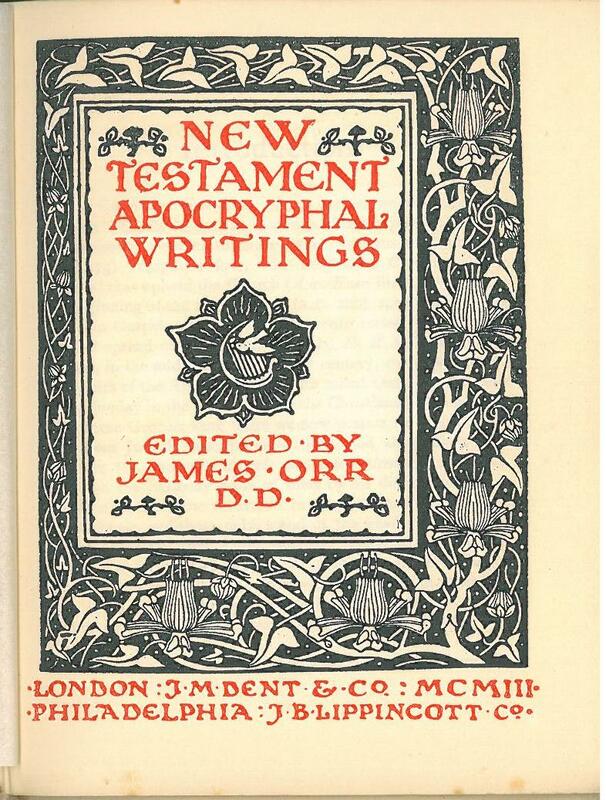 Comments: With the exception of the Gospel of Peter, the translations are taken from the volume on 'Apocryphal Gospels, Acts and Revelations' in the ante-Nicene Christian Library of Messrs T. & T. Clark, Edinburgh. The translation of the Gospel of Peter is that of the late Rev. John Macpherson, M.A., in Schubert's tractate on the subject, likewise published by T. & T. Clark. On this, however, several verbal changes have been made to bring it nearer accord with the present state of scholarship. — From the Introduction.